Check out the latest BOGO Free deals, chocolate gift sets, stuffed animal toys, and gift cards from Walgreens Weekly Ad Valentine's Day gifts Jan 27. 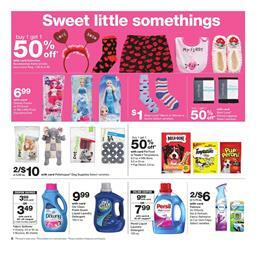 This is one of the first Valentine's Day sales from a weekly ad. You can find a great discount on a lovely sweet for this special day. If you want to celebrate in a classy way, Hallmark cards are also good choices. Moreover, you can get a $2 off when you buy 2 Hallmark cards. BOGO 50% off Valentine accessories will also be one of the top deals this week. Cute little gifts, Disney Frozen or Princess and more gift products are available on pg 7-8. Besides this week's Walgreens Ad is a sucessful presentation of many good deals from different categories. Beauty and cosmetic products like Vaseline lotion, Gold Bond, Olay Facial moisturizers, Olay Facial cleansers and more are BOGO deals. Visit the pharmacy section of this ad for allergy relievers, coupon savings, online discounts by Walgreens Ad.